Washington/Kansas City | Reuters — The Trump administration on Tuesday said it would provide up to US$12 billion in aid for U.S. farmers to shield them from the repercussions felt by trade spats between the United States and China, the European Union and others. China has targeted U.S. agricultural exports with tariffs in retaliation to those imposed by U.S. President Donald Trump, because the majority of voters in the farm states voted for him in the 2016 election. Republican candidates in the upcoming congressional elections in November, however, have expressed deep concern about their states’ farm economies. 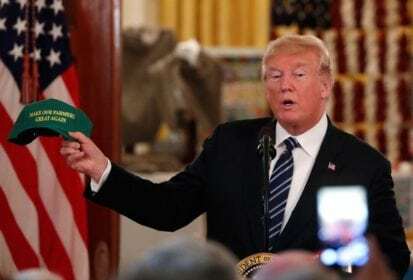 Trump has been talking for months about finding ways to aid farmers as China, in particular, has canceled orders for soybeans and other crops. Sonny Perdue, secretary of the U.S. Department of Agriculture, said the relief package will be financed through USDA’s Commodity Credit Corporation and thus will not require congressional approval. The aid is intended to serve as temporary boost to farmers as the United States and China negotiate over trade issues. “This obviously is a short-term solution that will give President Trump time to work on a long-term trade policy,” Perdue said. The Commodity Credit Corporation has broad authority to make loans and direct payments to U.S. growers when prices for corn, soybeans, wheat and other agricultural goods are low. In a speech to in Kansas City, Mo. on Tuesday, the president aggressively defended his trade policies. “We have to do it,” Trump said, blasting both China and the European Union. “But it’s all working out,” he said. Farmers would ultimately benefit from his approach, he pledged. Later this week, Trump will visit Iowa and Illinois, two other farm-belt states, as he seeks to shore up support for Republican candidates in those regions. Federal subsidies for farmers, however, are likely to place congressional Republicans, who typically resist large-scale government assistance programs, in a difficult position of supporting the president, a fellow Republican, or distancing themselves. Some were quick to denounce the proposal. “This trade war is cutting the legs out from under farmers and the White House’s ‘plan’ is to spend $12 billion on gold crutches,” said Senator Ben Sasse, a Nebraska Republican who frequently criticizes the president, a fellow Republican (all figures US$). “What farmers in Iowa and throughout rural America need in the long term are markets and opportunity, not government handouts,” Grassley said. Democratic U.S. Representative Jackie Speier of California, a major agricultural state, challenged the president on Twitter. “OK @POTUS – you created this mess with your trade war and now you are going to spend $12 billion to placate the farmers that voted for you,” she tweeted. The news, however, lifted shares of farm equipment companies on the prospect that farmers will have more money to spend on tractors and other farm gear. Deere and Co. jumped 2.7 per cent, while Caterpillar gained more than one per cent and Agco rose 0.5 per cent. Soybean futures, hit hard by China’s retaliatory tariffs, rose 1.2 per cent and hit their highest in two weeks as traders bet farm aid would improve demand, reducing a current surplus supply. “The best relief for the president’s trade war would be ending the trade war. Farmers need contracts, not compensation, so they can create stability and plan for the future,” said the group’s executive director, Brian Kuehl. — Reporting for Reuters by Ginger Gibson, Susan Heavey, Roberta Rampton and David Shepardson in Washington; Michael Hirtzer, Thomas Polansek, Caroline Stauffer, Mark Weinraub in Chicago; and Steve Holland in Kansas City. Writing by Susan Heavey and James Oliphant.